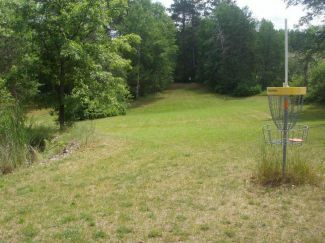 Description: Beautiful course surrounds ball golf driving range and weaves through woods along the Namekagon river. Elevation changes on 7 holes. Red, white and blue tees. Nice mix of tight and open. Open mid April to mid October. Fee: $3 to $5. Local Directions: From Hayward, go 2 miles south on Hwy 63 to a left on Timberlawn Rd., over RR tracks then left on Nursery Rd. Clubhouse is on the right.